Right after you have purchased your first Lionhead rabbit the daily caring begins. One should not underestimate the time effort you have to make in order to care for your rabbit. It is a responsibility that is comparable with caring for a dog. In contrast cats can care for themselves for a couple of days if they have enough food and water but this is not the case with rabbits. Especially when your bunny is still a baby lionhead he or she needs a lot of daily care and attention. 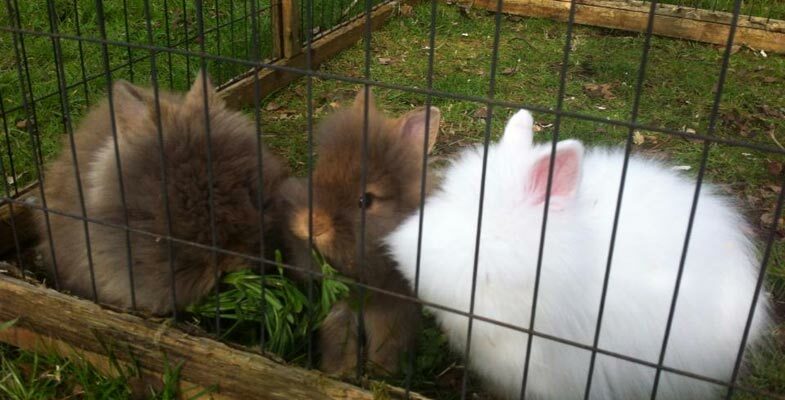 As mentioned caring for your lionhead is a task that requires daily effort. Feeding your rabbit is the most important element of the daily care. Lionhead Rabbits love hay and it serves as the main ingredient of their diet. Besides providing fresh hay on a daily basis make sure you also replace their water in order to keep it fresh. Moreover, when you replace their water it is important that you also clean their bottle or whatever you use for giving them water. When your rabbit is 7 months or younger it is advised to provide pellets as well. For more information about their diet we refer to the feeding page. If you have had before or have other rabbits right now than you will experience that caring for a lionhead rabbit is kind of less the same as for any other rabbit breed. However, there is one big difference. What distinguishes the lionhead from others is exactly the thing what causes that they require more daily care. Their unique manes need some extra attention. You can prevent your lionhead from getting tangles in his mane by brushing him several times a week. If their manes become that long that it reduces their visual sight you could consider to groom these areas. Please be extra careful when doing so because you can easily hurt the rabbit if you make a wrong move. Grooming your lionhead rabbit prevents tangles. When a lionhead rabbit starts smelling this is an indication that they are unhealthy at that time. Therefore it is essential to monitor their health several times a week. Even if you have the slightest concerns please always pay a visit to a vet. It is better to prevent than to cure. For more information about any possible diseases we refer to the vaccinations page. You have to dry them well. I almost lost 2 of my rabbits because I did not dry them properly. They ended up in the vet for 24 hours… Nowadays I use baby wipes and a brush. Rabbits do not need to be bathed, they groom them selves, it can also cause stress and your rabbit may panic and could injure itself. The only time you may need to give you bunny a bath is when they get really dirty and make sure not to get you rabbits head wet. Bathing can also damage their coat. I just use a wire brush and gently comb. My gr dr gas one and wants to know if she can give it a bath. It’s still a baby, also. In a rabbit book I read, it’s not advised to give them baths unless recommended and told how to by the vet. Rabbits can be very nervous when given a bath. It did say you can spot clean them carefully as needed. You can use a cloth and spot clean. But baths can kill rabbits. Hi Shannon, I just came across your great advice on helping to keep our lion heads clean and healthy, thank you! I live in NJ and my 18 year old daughter brought home one after I told her no, since I didn’t feel she would be responsible enough to care for one. So now I’m left with caring for this little (or I should say huge) cutie! She never developed a connection, so Mocha is still not all the way friendly or litter trained. We had her groomed and neutered months ago but now she is knotted up and looks sad. I would love to find her a caring home that can give her the love and attention she deserves…any advice would be so very helpful. Thanks Shannon. Could you wipe with a baby wipe? We just got our lil Lucy about 3 weeks ago and she doesn’t stink, but I wanna take care of her. Everything I’ve read states that you should NEVER submerge a rabbit in water to bathe or otherwise as they can get hypothermia quite easily. You should only “spot” clean them with a little water, or use baby wipes or a dry formula developed specifically for rabbits. Makes sense to me. Our bunny has a lot of matted fur. We brush him several times a week, but it’s still bad. Can the furballs be cut out? I take mine to the groomers a few times a year and she files his nails also. I do bathe him myself with lil water and a washcloth. He likes it and just sits while I wash him. Rabbits are very nervous animals so bathing them may scare them to death unless the rabbit seems very calm in the first bathing incident. Not advised as a result. You can cut out mats, I do it all the time on my lionhead angora rabbit. Never have cut him because I have my dad hold him in place on his lap and carefully trim the mat after his fur has outgrown about 2 cm. If the mat is very close to the skin, not advised. Either wait or shave with a electric clippers. Most vets do not shave rabbits so this is why most rabbit owners need to learn how to do this properly. It’s laughable some of the comments on this page…if you don’t know why a rabbit should not be bathed you have no business owning a rabbit. Also, nail trims with a human nail clipper is very diy easy. Unless your rabbit bites, can be done while having a friend or family member hold him in their lap. Just cut them a cm. No more because you may cut you rabbits quick. If you don’t feel comfortable or can’t see the nail quick, then go to your vet…but I’ve done this and even the vet cut my rabbits quick…bled for 5 minutes so beware. Decide pros and cons for your rabbit and situation/comfort level. I sing softly, like a lullaby, when I’m petting her; she loves it. they love to have things to hide under or in like a box or basket or low furniture, also cheap towels to sit on or hide under. She needs many wooden things to chew and I give her rugs that are cotton that she can chew on. Also loves to chew cardboard and I tease her with toilet rolls which she throws and I say “good girl”. I always call her “good girl” and give a treat like a piece of apple with a pet on the ears. I just got my double mane lionhead rabbit this pat Saturday she is 9 weeks old and I named her Bella I will be showing her at my county fair this April now I saw that they may enjoy playing with toys what and which type would be the best for her. And with this being my first time taking care of a lionhead do you recommend any tips. Only other animal i have raised that is close to a rabbit would be guinea pigs. A tips would be greatly appreciated. My lionhead rabbits LOVE toilet rolls with no tissue left. My rabbit enjoys tunnels, toilet paper tubes and paper towel tubes. Also baby toys and cat toys work great! AJ, you can’t just give your rabbit hay when she is good!! They need unlimited hay! That’s VERY important for their diet! My Black Tort hates me. Whenever I feed it it tries to bite my hand off and when I pet it, it tries to make me bleed. It is so ungrateful! I mean, I have no friends and I’m not a very likable person. I guess it’s just me then…. Oh well! If he/she is not neutered or fixed, they will be more aggressive. If it is in pain it will be more aggressive. I have to bunny talk (grunt) or sing to my bunny in order for her to enjoy being petted. Many do not like to sit in a lap but they like to sit next to me on the floor or bed. Like any animal, we have to learn their likes and dislikes to successfully bond. Keep some kind of salt mineral in its cage. Salt is needed in their diet just like people. If it is trying to bite you it might just be wanting the salt in your blood. My vet told me that if they don’t have enough salt in their diets and they bite you and taste the salt in your blood, they might think that it is ok to bite you. What type of hay? Grass or alfalfa? Alfalfa for babies, to rich for adults. Timothy or grass hay for adult rabbits. I just got a double mane i need to know is alfalfa hay what i should give her daily? The breeder told me pellets mixed with hay…. sjes about 11 weeks old.. or should i give her timothy hay… she poops alot though and pisses everywhere i put a kitty litter in her cahe I don’t know if she uses it its pine litter no not shavings just chunks of pine.. I read that if you use kitty litter: do not use pine or clay varieties. No, I think not , I’ve heard not to use shavings. I use a puppy pad or newspaper that is printed with soy ink. I use a mixture of Carefreash unscented and Yesterday’s news paper based litter with a pee pad on the bottom of the litter box. I highly recommend litter box training your rabbit and putting fleece in the cage. NEVER use clumping litter, pine or cedar shavings, also don’t use scented litters, they can damage you bunnys nose. Put a hay rack by your bunnies litter box, they like to eat and poop at the same time, this will also help with good litter manners.Good luck with your bunny! Does anyone know any good types of brushes I could use for my Lion head? do rabbits get hot spots? How often should you clean rabbit feeding utensils? It was really nice that you pointed out that lionhead rabbits require more daily care, especially when it comes to their manes as they have a thick head of fur. I noticed that when I saw the picture, and I realized that the rabbit I found was a lionhead. I intend to keep it, so I decided to research and saw this post. It might be best for me to see a professional groomer instead so that she will be well taken care of. Thanks for the info.